Winter is one of the best times of the year to visit waterfalls. While many people head to the mountain for downhill or cross-country skiing, the trails leading to my favorite waterfalls clear out. Some offer a chance to snowshoe in, while others can still be hiked, but regardless of the access, the waterfalls are at their best. They'll either be running in full flow, or if you're lucky, they'll be frozen over. 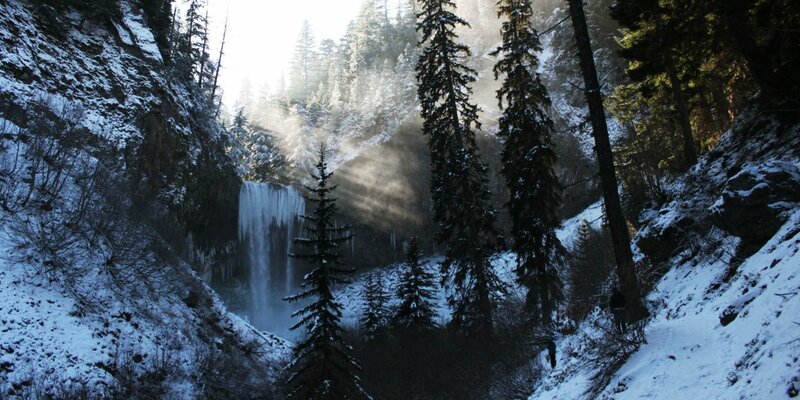 Here are 13 recommended waterfalls to visit in Oregon and southwest Washington in the winter. The few from Washington were included as they are not far from Portland. If you have a favorite that's not on the list, I invite you to add it to the comments below with your photos. Considering its combination of accessibility and natural beauty, Tumalo Falls is one of Bend's most visited winter areas. To escape the crowds and extend the trip, continue past the falls to Tumalo Creek. This majestic and relatively unknown waterfall is 35 miles south of The Dalles. At the state park named for the waterfall you'll also find the accessible ruins of a decommissioned hydroelectric power plant that operated from 1910 until 1960. Tamanawas Falls in a blanket of snow. Photo by member Meg Townsend. In the winter, the hike to Tamanawas Falls provides beautiful views and a less congested trail. Check road and trail conditions before departing to this waterfall on the eastern slopes of Mount Hood. This waterfall is actually in southwest Washington's Indian Heaven Wilderness. In addition to intimate views of these powerful falls, you get to hike through old-growth forest along Falls Creek. Just over an hour outside of Eugene, Sahalie Falls is along the McKenzie River in the Willamette Foothills. It's about a mile to walk from Sahalie Falls downstream to Koosah Falls, the next waterfall on the list. Heavy snow can challenge winter parking and access, but the falls are much less crowded in the winter. If you're visiting Sahalie Falls, continue for a mile downstream on the McKenzie River Trail to Koosah Falls for another impressive waterfall. Like Sahalie Falls, the crowds thin out considerably in the winter. Direct access to Koosah Falls is also available at the trailhead just upstream from Ice Cap Campground. Weather and road conditions permitting, a winter visit to Proxy Falls is a treat. The easy trail takes you through a lava field and into dense forest, rewarding the visitor with two beautiful waterfalls. Expect to get drenched from the waterfall; bring a change of clothes and some good insulating layers. Note that Highway 242 closes seasonally, so be sure to check road conditions before you depart. There are two Sahalie Falls in Oregon, and this one is near Mount Hood just off Highway 35. Smaller than the McKenzie River's Sahalie Falls referenced above, this one may offer a chance to snowshoe or cross-country ski in the winter. Check road and trail conditions before departing. Abiqua Falls. Photo by Tyson Gillard. 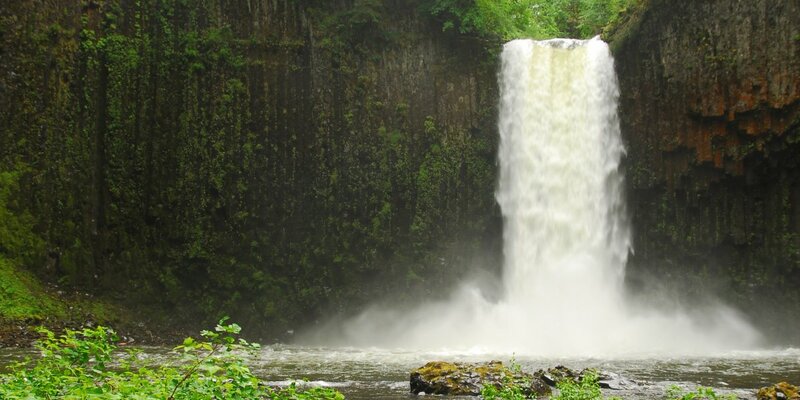 It's one of Oregon's most beautiful waterfalls, cascading 92 feet into a perfect basalt basin. To access this falls you can either navigate the rough forest road to the fall's trailhead or walk the extra 2.5 miles each way from the more well-maintained road. The base of the falls may completely freeze in winter, allowing you to get so close to the waterfall you can actually touch it. Visit Oregon's third-tallest waterfall as it descends over 280 feet into a basalt amphitheater base. Weather permitting, you can also hike up the nearby trails to see more spectacular waterfalls nearby. Fall Creek Falls is on the same trail. The Rogue River Gorge is an accessible and memorable location near Crater Lake. Here the Rogue River narrows to 25 feet as it passes through a 500 foot chasm. Follow the trail to where the water disappears underground, only to reappear downstream as a wider and gentler river. The last of the waterfalls on our list is also in southwest Washington. In a series of steps, the falls drops over 130 feet. A constructed viewpoint is accessible year round, while some rough trails allow you to see the waterfall area from other vantage points. The crowds tend to die down in the winter months, but the waterfalls are just as spectacular. Adventure down the Trail of Ten Falls, but be careful on the trail as it can get quite icy near the falls.